If you're walking up Market Street, chuck a left into York and stroll down for a minute, you'll find yourself at Sourdough Panini Bakery & Café – one of the best (and cutest) cafes in Sydney's CBD. 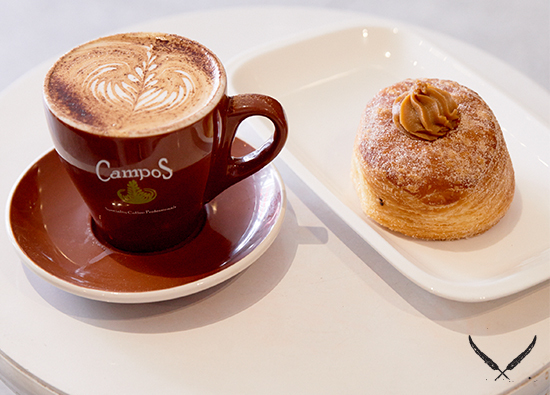 Cute space, friendly staff and delicious coffee that is in your hand within a minute of ordering? Sign us up! Sourdough Café sells the classic breakfast fare. 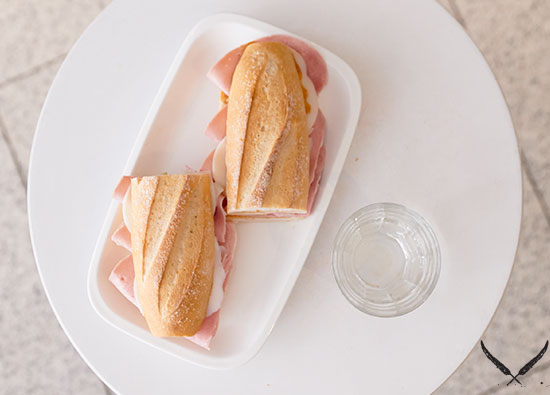 For those who want to keep it simple, there is organic sourdough or raisin toast with sweet or savoury spreads (yes, they have Nutella – don't panic), while others may opt for the bacon and eggs on Turkish panini with house BBQ mayonnaise. We went for the grilled bacon and aged cheddar on raisin toast – and the mix of savoury ham and sharp cheese on sweet, spicy fruit toast was everything we never knew we needed in a breakfast. 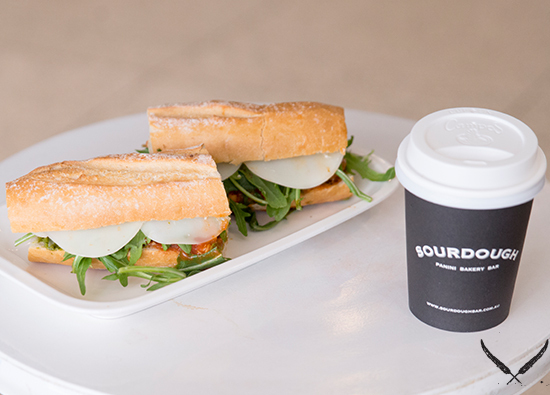 What's more is that the prices at Sourdough Café are refreshing to say the least – with many places charging up to $8 for two pieces of soggy, over-vegemitey toast, it's good to know you can rely on Sourdough Café for a speedy, delicious coffee and breakfast that won't even set you back $10. Moving on to lunch, it's important that you get in early and don't miss out on the house-made paninis. We tucked into the pulled roast pork with iceberg, apple coleslaw and mayo with pickled beetroot lettuce; and it was the perfect combination of melt-in-your-mouth, heavenly soft pork and crunchy, slightly sweet coleslaw. Next came the premium meatball panini with napoletana sauce, provolone AND parmesan cheese, rocket, pesto and house mayo. It was a saucy, meaty, cheesy delight and we immediately regretted agreeing to share. Finally, we couldn't resist the promising Real Reuben, featuring corned beef, provolone cheese, sauerkraut and Russian mayo. Was it messy? Yes. Was it worth it? You bet your sweet bippy it was. When it comes to sweets, there's good news and bad news. The good news is, Sourdough Panini Bakery have plenty – including cronuts, Oreo tarts, and the best damn chocolate croissant we've had in years. The bad news is, you probably won't be able to stop at one. 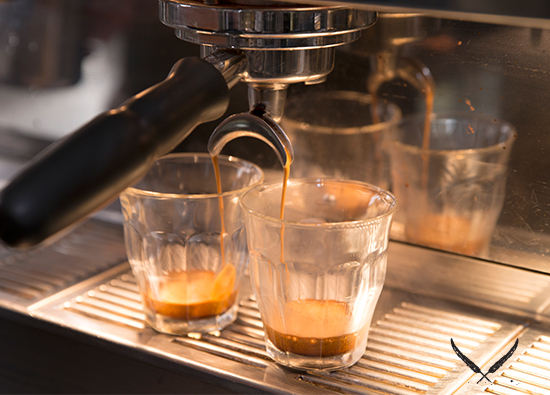 With its delicious food, fast coffee and enviable price tag, Sourdough Café will soon be your new favourite CBD café – thank us later! TUL Note: Today's List Love post is proudly sponsored by Sourdough Panini Bakery & Café and endorsed by The Urban List. Our sponsored posts will never be a secret — the List Love seal will be stamped on any sponsored material you see on the site. Thank you for supporting the sponsors who make The Urban List possible.